Vegetarian sloppy joes? What the…? Trust me, my friends. These black bean sloppy joes are everything you want from a good vegetarian recipe. And from a sloppy joe, for that matter. They’re flavorful and filling. They’re easy to make and appropriate for a quick dinner on the go. I discovered this creative vegetarian recipe in a cooking magazine – but it wasn’t a featured recipe. It was an ad for Texas Pete hot sauces. I made a few tweaks to the original recipe based on what ingredients I had on hand. A 15-ounce can of black beans usually costs less than $1.00 at the grocery store. But if you really want to save money on an already-cheap food item, buy dried black beans and soak and cook them yourself. A bag of dried black beans costs about $1.50, and yields several cups of beans. Not going to use them right away? Freeze them for future use. Not vegetarian? Check out my classic oven-baked sloppy joe recipe. Got leftover black beans? Make these awesome black bean burgers. The black bean filling has a definite chili flavor to it. Instead of serving these on slider buns, try serving them with garlic bread and traditional chili toppings like shredded cheddar cheese, sour cream, and chopped green onions. In a large saute pan, heat oil until simmering. Add onions, jalapeño, and bell pepper, and cook for 5 minutes. Add garlic and cook for another 30 seconds or so. Add beans, tomato sauce, ketchup, buffalo sauce, and heavy cream. Simmer for 15 minutes, stirring often. Add a bit of water if needed. Serve on toasted slider buns. These look delicious, Haley! I’m adding these to the menu! These are right up my alley! 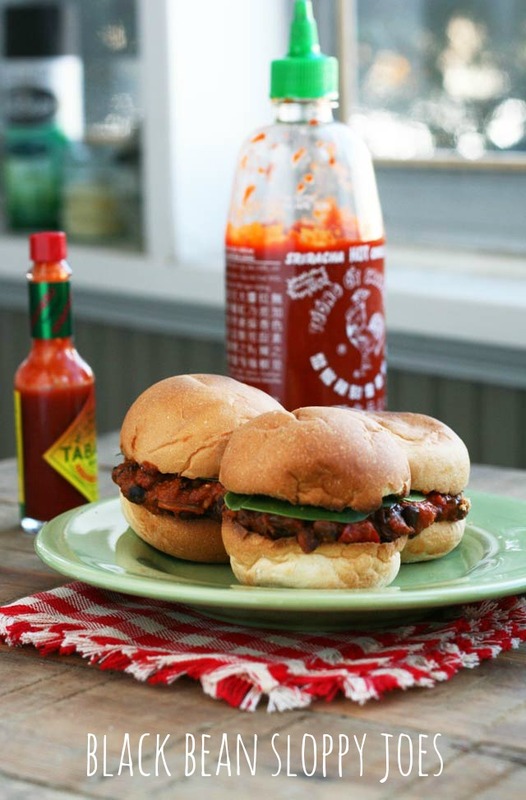 I used to love sloppy joes and I really like this healthier take on them. made these last night and they were delicious! They were a little bit runny, so could have possibly used less buffalo sauce or less tomato sauce, but we’re still amazing. Also used canned coconut milk instead of heavy cream to make it vegan. We served it with sweet potato fries. Good stuff, thanks!